2015 was the end of an era for the Nationals, with a couple of long-tenured big contributors leaving. But while some think the window of opportunity for them has closed, I think that is a bit too parochial. Teams lose players all the time, and constant retooling rather than occasional rebuilding can make a good team into a good organization. 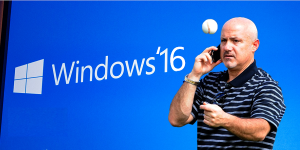 Teams have windows of opportunities with certain players, but for good organizations, windows are open most seasons. Unlike last offseason, when the Nats didn’t seem to have too many moves to make other than trying to find a starting 2B (I suggested a platoon partner for Danny Espinosa, or signing Kang, but instead they traded away a big piece from their soon-to-be garbage bullpen), they are seeing some real changes. The loss of Desmond may be greeted with a “we’ll miss you but it’s time”, whereas Zimmermann might be more of a sting. So where should the front office go from here? Alright, two more pitchers, but now it’s time to actually make some decisions. My first decision: Anthony Rendon will no longer play 2B. It’s not that he isn’t good at it, but a healthy Rendon has a bat that plays at third, and while, sure you’d love that bat at 2B, I’m too worried about his play there making him unhealthy. It is definitely a more physically demanding position, and he’s shown himself to be injury prone since before we’d ever heard of him, so I want him at third. Of course, if he’s at third, that means Yunel Escobar isn’t, so what does that mean for him? I’m not sure. But I do think, between Rendon and Escobar, plus Trea Turner, Espinosa and Wilmer Difo, they probably have one too many guys there. 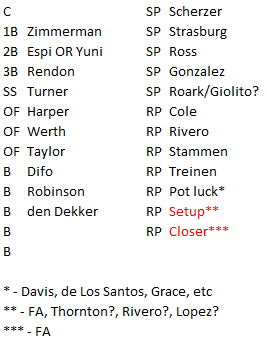 So, after moving Rendon to third, my second decision will be to trade either Escobar or Espinosa. I lean towards trying to trade Escobar, for several reasons. First, I’m a total shill for Espinosa. Second, Yunel had trouble feeling “comfortable” at 2B this spring, so they moved him to 3B, and there’s no telling if that will change. Third, and most importantly, is that I think 2015 was a high water mark from him. He had his highest AVG and BABIP since 2009, the second highest of his career, and was a sub-.700 OPS guy the three years prior. Keeping focused on the hitters, they have some choice in the outfield. First of all, I would give Denard Span a qualifying offer. If they want to give Michael Taylor another year of seasoning as a 4th OF, it’s an intriguing opportunity. But Span’s reaching his first year as a free agent, and despite the injuries, I think he’ll refuse the offer. So let’s assume he does, should Rizzo go out and get another outfielder? There is the possibility of spending real money and going after someone like Justin Upton, playing Bryce in CF. Something like $50M will be coming off the books, so the money might be there, and it would certainly do something for the offense. What’s holding me back on that is – the offense was good this year. Streaky for sure, but still top 5 in the NL. So I’m not sure I’d want to sink that money into a corner guy, and hurt the defense in turn. Instead, I’d want to shore up the defense. The real problem with this team was on the other side of the ball – disappointing pitching and extremely sloppy defense. I think Taylor at CF helps with that. I’d even consider flip flopping Espinosa and Turner, putting Espinosa at short and letting Turner worry a little less about defense. They’ve also got another OF asset that flew under the radar a bit, Matt den Dekker. He was acquired to platoon and hit righties, and he did that quite well, with a .267/.330/.512 line against them. 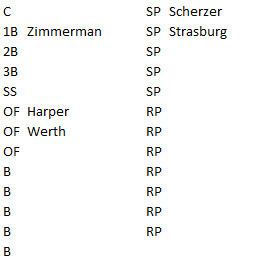 When used the right way, maybe giving some days off to Werth and Taylor occasionally, he could be a really good 300 PA player for them. That’s a pretty full team. 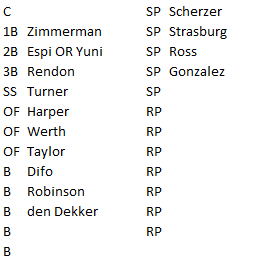 Before discussing catcher, let’s try to fill in some more pitchers. I’ll give Tanner Roark the nod as the 5th starter, and I’d give A.J. Cole a long relief/6th starter role, at least until Lucas Giolito is ready. If Roark stumbles, or someone else gets hurt, and Giolito shines in the minors, he’s gotta be called up. Felipe Rivero had a very nice rookie season and looks to be a late innings guys, so he gets on the roster for sure. Craig Stammen should be back, along with his career 3.03 ERA as a reliever. Blake Treinen still makes me nervous, but he’s looked good since returning from the minors, so I’ll keep him. David Carpenter is under team control and if he’s healthy, he’s been great and could be a big help. His health is a question mark, but if they think his shoulder injury (shudder) isn’t a big deal for 2016, than keeping him is a no-brainer. Matt Thornton was the best reliever on the team in 2015, and I’d also see if he’s up for a return stint. That leaves the two spots that Drew Storen and Jonathan Papelbon currently occupy. I’d get rid of both of them, and I think both have decent trade value. 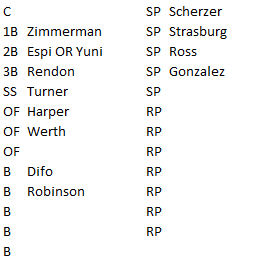 Starting with Storen, Rizzo doesn’t seem to have enough faith in him to close in the playoffs, and there’s too much risk that Storen-as-setup man just won’t work. His numbers (29 saves this year) suggest someone will want him in a trade. As for Papelbon, no matter what Rizzo says publicly, I just can’t see him staying. And this is my scenario-building, I don’t want him anyway, so he’s gone. Judging by the player reaction to the choking incident, there’s got to be some front office, somewhere, that wants an “old school” guy like him with that kind of “fire” so the Nats get something in return. Anything will do. But that means the Nats are lacking a setup man and a closer. That’s got to be the focus of the offseason, at least getting that closer. I’d be comfortable with Thornton at setup, and possibly even Rivero. Rivero has a live arm, and while he’s may be thought of as a lefty specialist, he’s been much more than that this year. The question is, after the bullpen disaster of 2015, are they willing to take a chance on him. I’d also seriously consider bringing up Reynaldo Lopez to put in the bullpen, who profiles as a late inning reliever. His ERA faltered a bit as a starter this year, but he still struck out a batter an inning. Moving him to the bullpen could put him on the path to future closer, he hits 99 mph on the regular and a few thought he should have been helping out in 2015. The 2016 closer, though, probably isn’t on the roster, so they’ll have to go out and get him. Setup and closer are most likely going to be external acquisitions (maybe with the aforementioned $50 M) so I’ll put them in red. Alright so we have a pitching staff, and our bullpen’s all set (because, you know, just going out and getting the right closer and setup man is super easy). All that’s left is catcher and some bench spots. Looking at catcher first, they have Lobaton and Wilson Ramos, and I’m not sure that’s enough. Ramos isn’t the hitter he once was, likely thanks to all his injuries. Despite his amazing record of no hitters caught, I’m not convinced he’s a spectacular receiving catcher, and his problems catching throws on plays at the plate are well known. Lobaton is only hitting as well as the 2015 Ramos, so he’s nothing special with the bat, either. Trading Ramos or Lobaton might be the best option, to option up room for another catcher. The problem, though is that there just isn’t much out there. The Nats may be able to trade for a quality catcher, and Jonathan Lucroy would be an intriguing possibility. He’s a catcher who can really provide some offense, with only a year left on his contract. Because of the lack of good options, Ramos might be their best bet, but they’d still need a strong backup considering his injury history. 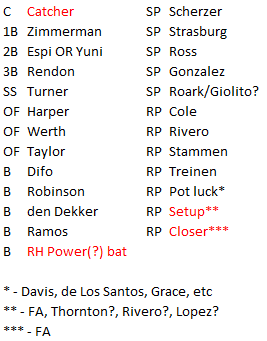 On to the bench, assuming Span doesn’t stay, that leaves just one spot to fill. With den Dekker and Robinson, a right handed power bat might be a nice touch. A year ago I might bet on Tyler Moore, but I think he’s played himself out of that. Uggla doesn’t cut it, either. Maybe there’s a righty platoon guy a la den Dekker sitting somewhere that Rizzo has his eye on, who knows. 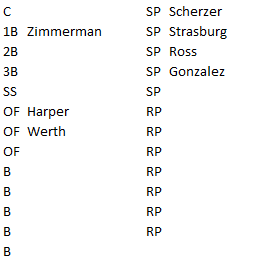 That’s a pretty good looking 25-man roster, unless Rizzo can’t fill those 2 bullpen spots and then it becomes significantly scarier. Using Escobar (or Espinosa or Difo) as a trade chip to make one of those acquisitions seems reasonable to me. 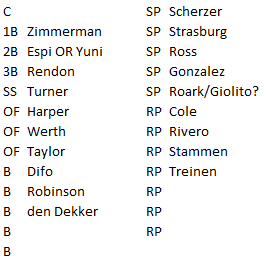 Storen and Papelbon are trade chips as well, and Rizzo will have to try to get creative as he tries to trade away specific players and fill some positional needs. Does that make a championship team? I don’t know! The Astros are in the playoffs this season. The Blue Jays look like the best team in the AL. The Blue Jays! The Rangers were 4 games under .500 one hundred games into the season and they won they West. You get the point. What these moves do, in my estimation, create a strong team that will have a good shot at the division, and really, what more can you hope to get in this league? I love Escobar. It doesn’t seem like you people see potential in him but I do. I always predicted that we’d be trading Espinosa & that’s fine so as for the trade of Escobar or Espinosa or difo, I’d vote for Espinosa. Other than that, this all seems to make sense. Will it lead us to the World Series? We don’t know until 2016 happens. But I just hope for the best regardless of the players we have or don’t have. Go Nats!